BDAG is a club formed in 1997 as a public service group in Geelong, Australia. We aim to train dog owners in motivational training methods, so that their dog understands what is required of it, and has basic manners suitable for living in harmony with people and other animals. 2) That owners are aware of their responsibility to others and their dogs. 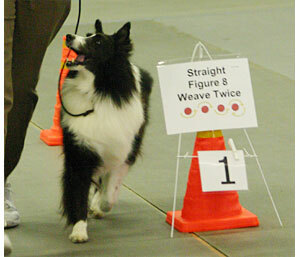 Rally obedience (also known as Rally or Rally-O) is a dog sport based on obedience. It was originally devised by Charles L. “Bud” Kramer from the obedience practice of “doodling” – doing a variety of interesting warm-up and freestyle exercises. Novice: The beginner’s class. The dog is on leash and there are 10 to 15 stations, the title is RN. Advanced: For dogs who have completed their novice title. Dogs are judged off leash, and the title is RA. Excellent: The highest class, for dogs who have earned their advanced title. 15 to 20 stations, including 2 jumps, are used in this class and the title is RE.